Our multi-ton Kumpi shipment was finally delivered today, woo-hoo! The shipping container we use has been amazing for storage/protection. Another new tool that has been worth it's weight in gold (and mind you, it's heavy lol) is a custom loading ramp we had Grainger build for us. No more hand-stacking with this baby, thank god, the pallet jack can now roll right up the ramp and into the shipping container with a few hefty pushes. Hooray! We have a huge number of dogs thriving off of Kumpi Dog Food. We can't recommend it enough. Do your pet a favor, educate yourself (visit the website or call the president, Evy, directly 303-693-6533) about their nutrition and get them on Kumpi. It's all about the health of the dogs and quality ingredients. It's trully the science of nutrion and not the "hype". Also, they have never had a recall, ever! It's a company you can trust and that is why we are on board with them. P.S. Here is a link to a great Kumpi fan site Kumpi Love, check it out and just in case you missed Hopes great article on Dog Food here that is... President/Owner of Kumpi, Evy, loved Hope's article so I'll say it again, too cool! Here our some clips just showing the tip of the iceberg of today's action. Barkley, Diego, Gordon & Patty from the Medium Roll. Also from the Medium Roll we spot Macs and Winston busting out a little. The Big Roll featured a ton of Grady and Max play. Upstairs, in the Little Roll, we have lots of ball time and a match between Henry and Lucy. Meet Zodiac (What an excellent name! ), he is a studly, one year old, seventy-five pound, German Shepherd that had his assessment early this morning. Zodiac's owners are having some training difficulties with him however he is a really neat dog regardless. In our Big Roll pack he did very well, spoke great dog for a youngin, played and all in all had a good time. He is welcome back anytime. As far as his training issues are concerned, we refereed his owners to the highly-skilled dog trainer Garrett Stevens (Alpha & Omega Dog Training). We hope some follow through and consistency, along with Garrett's guidelines, will help Zodiac and his owners communicate better. That darn "Dog Training"... It should be called "People Training", that is it's true definition. Often times, it is a lot of hard work and barely fun (not always, it can be fun too, I'm mainly refereeing to the humble beginnings) but once you see some baby-steps towards results it can be amazing. Bonding with your pet, while communicating with them properly and getting results, it can't be beat as far as convivial experiences go. P.S. Here is a quick clip of Zodiac's first few moments with Marco Polo, as you can see, it was awesome! Check out Sammy here... King of the Little-Tikes-Toy. Sam is a long time member of Fort Fido's Little Pack, one of the King's of the Little Roll really. He is a four year old Shih Tzu and is quite the character. Nobody pulls one over on old Sam, that I guarantee lol. Here is a great shot of Mr. Jack (a four year old, brindle, Boxer Mix, long-timer) having a blast in the Medium Roll like he always does. On a sidenote... Our hearts go out to Jack and his family. 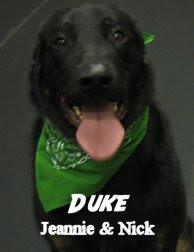 Unfortunately his big brother Duke (longtime Big Roll member) is going through some serious medical issues. Hopefully Duke will be able to overcome them. Get well Buddy, we know you can do it! At the end of the Beatles' song "A Day in the Life", an ultrasonic whistle, audible only to dogs, was recorded by Paul McCartney for his Shetland sheepdog. This is funny and I did not know this. I love The Beatles and of course, Shetland Sheep Dogs. A dog's whiskers are touch-sensitive hairs called vibrissae (New word yeah! Haha). They are found on the muzzle, above the eyes and below the jaws, and can actually sense tiny changes in airflow. Dachshunds are the smallest breed of dog used for hunting. They are low to the ground, which allows them to enter and maneuver through tunnels easily. So didn't know that these jolly little fellas (there are several at The Fort) were used for Hunting but apparently they were... Specifically for small game, badger and rabbit, in the 1600's. For Stephen King's "Cujo" (1983), five St. Bernards were used, one mechanical head, and an actor in a dog costume to play the title character. That Cujo, definitely not a "Feel Good" dog film for the family, entertaining none the less. French Poodles did not originate in France. Poodles were originally used as hunting dogs in Europe. The dogs' thick coats were a hindrance in water and thick brush, so hunters sheared the hindquarters, with cuffs left around the ankles and hips to protect against rheumatism. 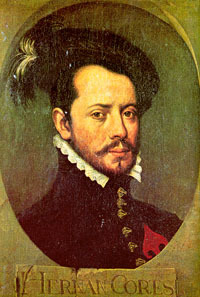 Each hunter marked his dogs' heads with a ribbon of his own color, allowing groups of hunters to tell their dogs apart. Yay, one fact I knew... You have to defend/explain that fancy-man-haircut some how right hahaha!? Hope your week has started off good! There weren't a whole lot of dogs here today, but that didn't stop them from tearing it up! Here are a couple of glimpses at the action. Emily, Mollie, Buddah, and Gordon were caught on tape running wild! There was a lot of doggie news today-- check out these cool stories! A dog helps to monitor a diabetic boy's blood sugar levels. Another pup keeps an eye on her mom's hypoglycemia. A family dog in Louisiana alerted the household to a fire. A cancer patient gets to meet a dog that is being given the same experimental vaccine. A family found their lost dog in a sinkhole, after six days missing. Don't worry--she's fine, and glad to be home. In San Diego, a puppy was rescued by the fire department after getting stuck in a split boulder. A deformed puppy, put in the trash, is recovering and learning to walk. A rescued foxhound is surrogate mother to four fennec foxes. Pet owners will have a neat alternative to microchipping. A five-year-old Pomeranian has his own Facebook--and nearly 2 million fans. Today is supposed to be the first day of Fall, so enjoy the last bits of sunshine! Not, this guy--a much cuter version! You may have already met Cortez, the newest addition to David, Nancy, and Marco Polo's pack. He is often seen on the counter in the morning, meeting and greeting customers and their dogs as they arrive. Cortez is a Rat Terrier mix, who is probably between two and three years old. We don't know too much about his past, he was found as a stray. This impish little guy is easy to love and keeps mom and pop on their toes. David and Nancy adopted him at the Pet Expo that was held at the Puyallup Fairgrounds in July. It was the world's largest pet and pet product expo, and will be held again sometime next year. In this clip from the Big Roll; Charly, Lulu, Mollie and Sam have a great pack-run-moment. One from the Medium Roll shows Fort Fido regular Niko doing what he does best, this dog can play well and play hard! Two from the Little Roll. One is just a cross section of the pack, the other, shows Frizzy and Samarah enjoying a feisty bout of play. Why did "Fido" become the generic family dog name? Now here are some outstanding clips from today's rolls. First up, Abby, Grady, Stella and Ziva have been romping hard all day together in the Big Roll. It has also been a Chocolate Lab fest in the Large Roll today, here, Osbourne, Kodiak and Grady have a triple threat match. They must know their the same breed lol. Things were fast and furious in the Medium Roll today as always. Miss Phoebe loves stirring up a pot of chase games... Buddha, Diego and Zeus pursue. Check Pearl out in the Little Roll, she found a big orange ball that she really digs... A clip was taken later in the day and she was still after that ball, too funny. Last but certainly not least, new pup Mooshu and Pearl had a late afternoon wrestling match that we were able to capture. What a blast! I hope everyone had a good weekend. Our manager Hope had an awesome blog post on Saturday, Dog Food Deceptions, I highly recommend checking it out if you haven't already. Our pal Evy, owner of Kumpi Pet Foods, thought Hope's article was wonderful as well, very cool! Some news headlines found today. When you buy a dog, do you know its background? Great idea here, workout and train your dog at the same time! Take it easy this week, good luck to all those Tacoma Teachers out there! I spent a great deal of time today doing research for a dog food reference that we could use to compare different brands of food to Kumpi. It was somewhat distressing to see how sneaky and misleading some brands were trying to be about their product. I quickly found that it was quite difficult to even get a list of ingredients from the main pages of many foods—I ended up getting the ingredient lists off of the Petco website! Seeing the ingredients, and how they fail to support a lot of the claims of the brand, it’s not hard to know why they made it difficult to find it online. There are a lot of little tricks that companies can do to try and “beef up” the ingredient list of their food. The most misleading (in my opinion) is to list different meats (like chicken, beef, etc.) in the top five ingredients. It sounds like something great—this food’s first ingredient is chicken! What it doesn’t take into account, however, is that the water weight in that chicken is counted in the tabulation. Water weight will cook off in the process of creating a dry dog food. The ingredient that you want to see is a meat meal. Meals already have the water weight removed, so there is a lot more bang for your buck. But in the money-making industry of pet food, even the apparently “good” ingredients can be misleading. If a company does not use human grade meat meals, then the meal is made up of mostly “leftover” portions, after the good cuts of meat have been taken for human consumption. A lot of dog-food ingredients are like this, and have a much lower nutritional value than human grade ingredients. We’ve all learned the same rule of thumb for looking at ingredients—the first five make up the majority of the product. It’s tempting to assume that the first ingredient is the “base” of the food, but this is hardly ever the case. There is just slightly more of it than there is of ingredient number two. So if you see a food that has Chicken Meal first, but it is followed by grain after grain, that food is certainly not chicken-based! Evy has a really great article up on her site about some of the deceptive label-making practices. When you are dealing with a giant company that is all about the bottom line (pet food will bring in an estimated $19.53 billion in the US this year), you can pretty well assume that it is not entirely about keeping your pet healthy. There are a lot of ingredients (sneaky labeling practices) that you should look out for. The first is vaguely listed ingredients. Things such as “natural flavor,” or “animal fat” should be viewed with caution. What exactly is a “natural flavor”? Where did the “animal fat” come from? Such vaguely defined terms can hide the true source of the ingredient—which may have been any “4-D” animal (dead, diseased, disabled, or dying prior to processing). If the company is not comfortable being explicit about what is in the food they are selling you, then you should definitely not feel comfortable asking your best friend to eat it! Kumpi uses only human-grade ingredients, and all processing is voluntarily held to human baking standards. There has also never been a recall, nor any sort of health scare with Kumpi. It is a food that you can rely on, from a small company that holds itself accountable. It was also formulated by a multi-species nutritionist, a true scientist who has dedicated his life to studying the exact effects of different ingredients. The company president, Evy, will talk to you and answer any questions that you have. Her phone number (her personal home phone) is right on the bag! Try and get that sort of commitment from any big commercial dog food brand. And a bag of Kumpi is 100% guaranteed—if it doesn’t work out for your pet, there is a hassle-free refund. The more I learn about dog nutrition and the pet food industry, the more I like Kumpi! My pup Gordon eats it (he does backflips for the stuff, no joke! ), and he is doing really well. Polo, Cortez, and Gibson are all on Kumpi as well, as are many dogs that attend daycare here at the Fort. If you are interested in learning more about the pet food industry, check out The Dog Food Project. They have a lot of great information up there about different foods and ingredients. If you want to see how your pet food measures up, just ask Dave, Grant, Nancy, or myself. If we don't already have your food's ingredient list, we can look it up and point out which ingredients you should be wary of. I'll see you again later! The first one is short but sweet showing the ball-of-furry that can be the Little Roll lol. In clip two, from the Medium Roll, Mr. Buddha's got a girlfriend (Phoebe)! The Medium Roll again, this one shows Mama Mimi schooling young Zeus and Buddha. In the Big Roll it was daily fun, as usual, you can spot Maggie, Howie, Benny, Maximus, Grady, Mcgee and Stella among others. When your dog is your best friend. Unfortunately, some of the pictures wouldn't upload, who knows why. Clips 6 - 10, all very good, enjoy! P.S. I think my favorite is now #9, that was impressive :) ! Today I'll embed clips 1 - 5, they are funny, be careful lol! #1 The original Stains from "Its Me or the Dog"
Hahaha, I think that one is my favorite! Be on the lookout for clips 6-10 of the Top Ten Funny Dog Clips of YouTube. I'd like to showoff our Communication Boards today. As you can imagine, taking care of 55 dogs (our average) a day can be a challenge. There is a lot of information to retain and reiterate amongst our team (David, Nancy, myself, Hope, Gary, Austin, Matt, Kelsey & Devin) to keep operating efficiently. 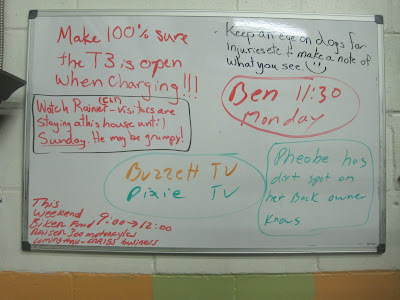 I took a photo of the boards one day... I'll help you decipher their invaluable, chicken-scratch, messages haha! 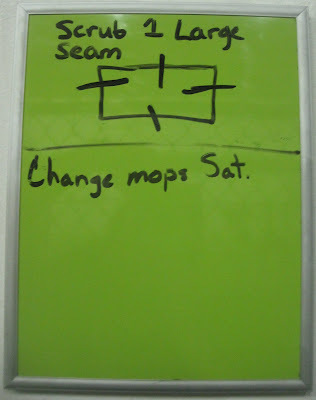 Big board number one: If we don't charge our floor scrubber with it's top open, the batteries can't vent properly. Then, rust and corrosion happen, not good! One note is a note to take notes lol. We had an appointment with a cleaning company owner "Ben". Phoebe the Vizsla had a dirt spot on her that looked odd, the owner warned us before she entered the daycare (very cool of her). Rainier had visitors in his home. We made sure everyone knew that just in case he began to act differently with the pack (yes, it happens). Fortunately, he was fine that week. Buzzette and Dixie were being boarded at the vet. TV = Take to Vet, PV = Pick up from Vet. Last but not least, there was a biker run that stopped by the scooter shop. Hope had to be prepared to deal with the influx of visitors/noise. Board two is little and easy... 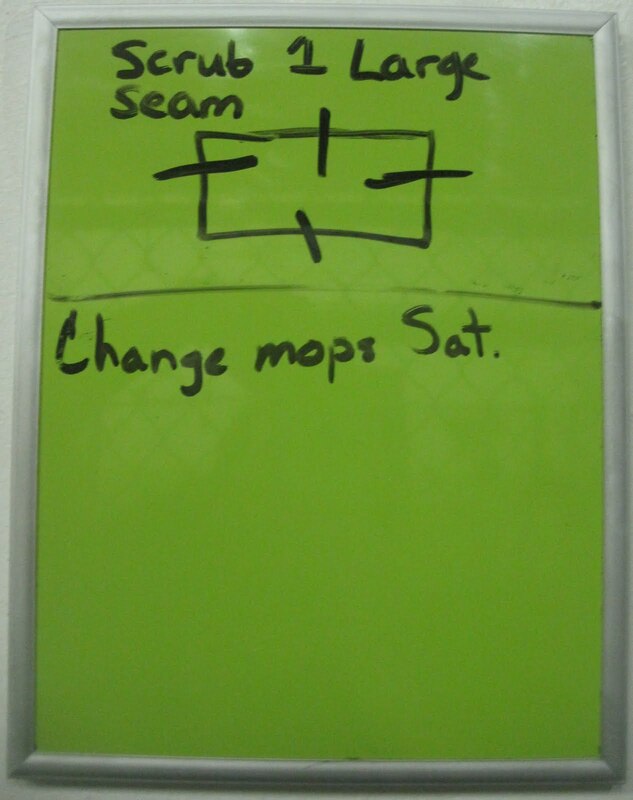 The Diagram shows the "Cleaner" what rubber-floor-seam they need to scrub by hand that day. For some reason, mop heads (3) needed to be changed on Saturday rather than Friday that week. Another little one, board three upstairs... It's usually covered (Go Nancy!) but had only one note on it that day. 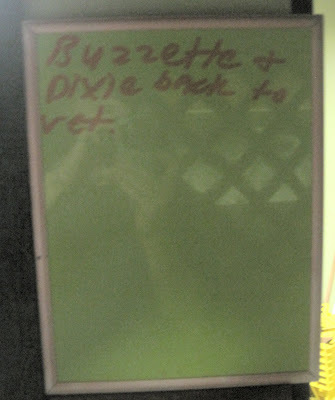 As seen on board 1, Buzzette and Dixie needed to be taken next door, after daycare, to spend the night at Fircrest Vet's boarding facility. Forgetting to take them would have been a BIG NO NO lol! Hence the "reiteration". Anywho, I hope you enjoyed this little inside peak of how we run things. Although not very "high-tech" the Communication Boards are key. They work and work well. When we find something that works well at Fort Fido we stick to it and get everyone on the same page! Enjoy that weather and your week! Sam's Second Stop at the Fort! 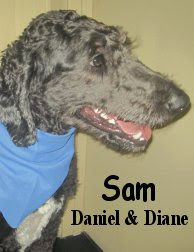 Sam is a spunky 2-year-old Golden Doodle who joined up with us on Tuesday. He's doing really well here at the Fort--he speaks really good "dog," and plays like he means it! I caught a great clip of him tearing it up with Mollie, a Golden Retriever. The two of them were best buds all day today! I'm glad to say that Sam is a wonderful addition to our pack. 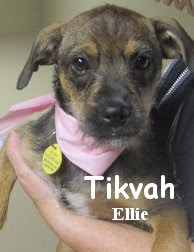 Today little Terrier-mix puppy Tikvah joined the little roll! She's about 14 weeks old, and weighs in at just over ten pounds. Her name is really neat, it means "hope" in Hebrew. We almost have the same name! She did well with the little dogs--lots of enthusiasm, tail-wagging and some really great play. Coming in so young is really great for the dogs--it gives them an opportunity to learn how to be social and how to create good doggie habits. I caught a clip of her busting out all the moves on little Lucy. Tikvah is definitely going to be a great addition to our little pack! Have a great, sunny weekend! Dog surfing competition in Del Mar I always love the photos that come from this event, it looks like sooo much fun! Ask Dog Lady I don't tend to argue with Dog Lady, she is usually spot on. Hero Dogs of 9/11 Pretty neat multiple page article with some intense photos. Tips for creating a dog friendly "Tailgate" Not a big football fan here but they are some great tips nonetheless. Man and service dog kicked out of restaurant I'm with the restaurant on this one assuming he really was running around off-leash lol. That is unlike any service dog I've ever seen. Colorado Coonhound sets record for longest ears Holy Cow, hahaha! A note about the upcoming busy time & clips. With September advancing, things are getting busier and busier around here. Busier around here is a good thing but it can get a bit "hairy"when there are several customers/dogs in our small lobby. With that said, please bear with us during pickup and drop-off time. We are always going as quick (and safe) as we can. Also, please stay in "conscious control" of your pet and remember that they aren't all "buddies", especially on leash! Thank you for your understanding. Buddha and Hunter battle it out early on in the Medium Roll. Our little guys are always up to something... Mostly, playing fetch! To us lol! I hope y'all had a nice Labor Day Weekend and took it easy. Sunday the fourth marked Fort Fido's Fifth Anniversary. Wow, five years in the business happened so fast, it has been nothing short of amazing. We look forward to the next five years, we will be doing our very best to continue being the premier Dog Daycare facility of the South Sound. Special thanks to our wonderful customers, there is no way we could have made it this far without you! Over 500 dogs have passed through our doors to date, incredible! Thanks to the many of you that have been with us since the beginning. It has been a treat watching your pups grow into healthy dogs over the years. One more thanks to my business partners and parents (David and Nancy), my, what we have accomplished together, I'm quite proud of you both. Ok I lied, one more thanks... Thank you to the Fort Fido Staff! In particular, Hope, Gary, Austin & Matt. Keep up the good work, you guys rock! In other Fido news... Basic Obedience and Leadership class with Garrett Stevens starts tonight, we'll see you at 7:15 PM, don't be late ;). I spent the weekend with The Band playing in the Ellensburg Rodeo Parade as well as the Roslyn Parade. It was a blast, for some reason we are treated like rockstars out there lol... It's standing room only everywhere you turn, especially in the pubs. Here are just two of the 190 photos that were on my camera. This cute pooch's vest said "Adopt me". There were a handful of rescue-dog-organizations involved with the two parades. For our five year anniversary present, we bought ourselves a Viper... That's a new floor scrubber by the way, not to be confused with the sports car hahaha. Have a great day, stay cool this week! Patrick Lomantini is already in the Guinness Book of World Records (for cutting hair for 72 hours straight), and he is setting off to do the same again! This time his goal is to do 50 haircuts in 50 states in 50 days. What's more, he is not being paid for his efforts--all proceeds are going to a local animal shelter. So fifty shelters are going to be getting a little extra media coverage, and a little extra donation. This is a very innovative way to bring the plight of shelter pets to people's attention. In Washington, donations will benefit the Seattle Humane Society. If you want to be a part of this, Lomantini will be cutting hair at the Gary Manuel salon in Seattle on September 9th. Suggested donation is $20. I'm going to have to try and squeeze that into my schedule! The Seattle Times has a good list of dog-related events for the month of September. Some highlights are dog-friendly hikes with the Issaquah Alps Trails Club, the 5k PAWSwalk in Seattle, the annual Pooch Pool Party at Steward Heights pool in Tacoma, and at the end of the month, the Vashon Sheepdog Classic sounds like it will be loads of fun to watch! There were a few dogs in the News as well. In Alaska, an incredibly brave woman punched a bear in the nose to save her dachshund. A toy poodle led firefighters to a man asleep in the basement of a burning house. Without that pup they may not have found him in time! This next story comes from Cuba, where a farm dog has been suckling piglets. The piglets chose the pup over their own mother! Don't forget to include you pet in your Labor Day plans! Make certain that your pup is securely leashed, fenced, or crated in case of fireworks or rowdy neighborhood barbecues, lol. It's going to be be a hot one, so make sure that if you are headed out you bring along water for yourself and your pup. Well, I finally managed to convince everyone that needed convincing-- my landlord, my roommate, and myself--that it was time to take the plunge and get a puppy! 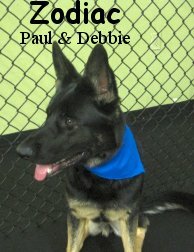 My husband and I were looking for a clever, working dog to be a partner in our family. Gordon is three-quarters Malamute and one-quarter Husky; at twelve-weeks he already weighs 22 pounds! Gordon has been coming with me to daycare this whole week, and it's really helping to get him socialized. He goes in with the medium dogs, and gets to play with a whole range of sizes. I caught a cute clip of him tearing it up with little Sofee, with Happy sniffing around trying to get a good look at the new guy. Gordon and I will be starting obedience training here at the Fort next week. Class starts on September 6th, and runs from 7:15 pm to 8:15 pm on Tuesdays and Thursdays for three weeks (a total of six one-hour classes). Stop by or call if you would like to take the class, there is still space available! Hank was in for his assessment this morning. 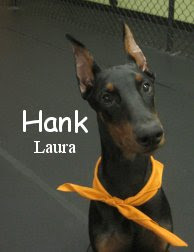 He is a very handsome and regal looking six month old, thirty-five pound, Doberman Pinscher. When meeting Hank, it is clear to see that he is the epitome of a successful breeding program. It shows not only in his physical body but in his temperament. We have seen a handful of Dobermans over the years but none like this, none as balanced. They are a very powerful breed that have a "tough" reputation. In the wrong hands, like any breed, they can be dastardly. Hank played surprisingly well in the Medium Roll. He greeted the dogs perfectly and enjoyed his stay immensely. A very playful pup, Hank is welcome at Fort Fido anytime. We commend his owners for doing their research on this breed and finding a very reputable breeder. Outstanding job today Hank, see ya soon! P.S. Hank's older sister has attended The Fort for some time now... She is spunky, Italian Greyhound, little roller Fendi.